So sorry I am late posting tonight but we were invited out for dinner then when we got home we had to get the woodstove going as it is really chilly this evening and going to dip a bit more tonight. I didn't get a chance to put some fiber on this tag yet but no fear it will be done. On this tag I did some distressing again with Peeled Paint and a tiny bit of Broken China, love the 2 colour combos. I inked the edge of the tag with Peeled Paint. 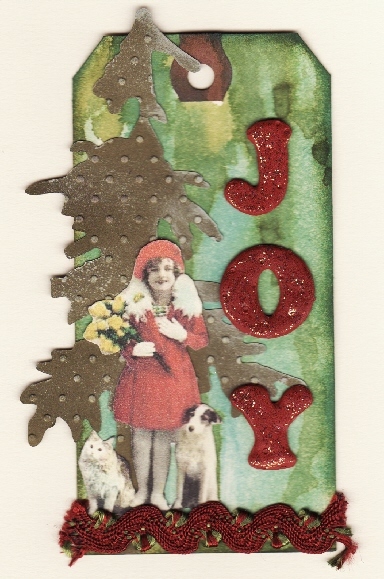 I cut a tree from again Tim Holtz Alteration Die then ran the tree through my Cuttlebug to get tiny dots all over it. Then not sure I like it looking at it again but I just lightly touched the tree with ColourBox white ink and I did it lightly down the side. I think I might touch it up with my texture snow instead the white looks more green here to me. Like many of my images I searched on FlickR and got this great one with a girl dressed in red and her two pets. Then I took some fun foam letters that were blue yellow and I think pink and painted them with Tomato Spice Delta acrylic paint. Let it dry then I put my stylus in white paint and made dots all over the letters after they were dry. I added a bit of Diamond Stickles again for some bling then added a bit of ricrac from my stash that my friend Jenxo sent me some time ago and that was it. Easy Peasy. I am so happy some of you are enjoying my tags. They are fun and each one turns out different. Tomorrow's tag is going to be just a bit different and not really into grunge or distressing but on a watercolour side of things. Stay tuned and don't forget to post. I know a couple peeps that are posting daily and you have a chance to win one if you keep posting every day. I don't pretend to be Tim Holtz, yes I have some of the Ranger products but I say, do what you feel is right for you and what you can afford. Think outside the box and just go for it. Art is what you make it and this is what I enjoy. Thanks for dropping by and hope to see you back soon. I like your take on the tag very much, Lesley! Love your tree, it's a really nice one with the embossed dots! The girl is beautiful too! this is really lovely les, glad the ric rac was of some use :) the image with her red coat is adorable too..
Adorable! I totally agree, Tim is great - but he's hard to keep up with in terms of "toys" and supplies. Mine might be more like his, but I use what I have and freely make substitutions as well. That, for me, is the challenge! Loving your tags...only a few more!! Thanks!